"What? No, I'm having a great time. Why do you ask?" We’ve all been there. Staring across the table at someone who’s insisting that they’re happy at H&R Block, but thinks that this X Factor audition on Saturday could be the start of something big. Sure, they’ve only sung in front of their friends and family, but they seemed to be genuinely amazed at how good it sounded, even though she was really just singing “Happy Birthday”, but if I’d like she’d be more than happy to sing me something there at the table. OK, maybe we haven’t all been exactly there, but somewhere just like it. Out on a date with a person that’s perfectly fine, just not…perfectly fine enough, and immediately the tally starts going in your head. “Money I’ve wasted on this date: $40…Time I’ve wasted with someone I never want to see again: 45 minutes…How long it’ll take me to get out of here: half hour, if there’s a fire. Otherwise, I’m fucked.” But why do we have to be fucked? "Uh, I gotta go. 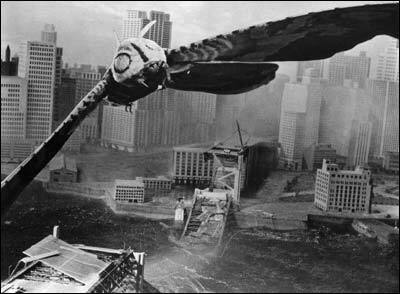 My apartment is being attacked by a giant moth." 1) Receive an emergency phone call from a friend. 2) Place an emergency phone call to a friend (so confusing that the date usually gives up). 3) Pretend to get food poisoning. 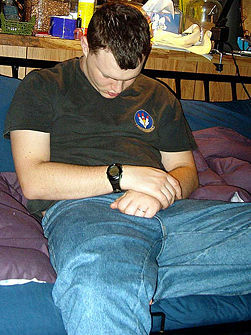 4) Sneak undercooked shellfish into date’s dinner or cocktail, giving her food poisoning. 5) Turn on all the faucets in the bathroom and insist there is a flash flood. 7) Dress up like Godzilla and attack the bar. 8) Tell your date you’re a Republican. 9) Tell your date you’re a Libertarian. 10) Ask her if it’s cool if you write about this on your blog. I’ve done each of these, and trust me, they all work. But there has to be a better way, doesn’t there? There’s gotta be, because I’m getting real tired of wearing a Godzilla costume under my date clothes. What we need is some sort of signal. Something you can say or do at any point in the date that just calls the thing off. They’ll be no risk of hurting anyone’s feelings or making things awkward because you’re not saying anything that’s actually insulting. Every time I consider ending a date early, I’m terrified that in trying to say “You seem like a great person, and thanks for coming to meet me, but I’m just not feeling a spark”, I’ll blubber and stumble and end up blurting out “You smell. I’m outta here!” But a code word will fix all that. I just say a simple phrase and the woman understands all the nice things that I’m far too awkward to express in actual conversation. I can use it, she can use it, anyone can use it at any moment, and we’ll all understand that even though we’re both wonderful people, it’s time for this date to end. No hurt feelings, no uncomfortable silences, it’s like heaven! Or a version of heaven where bad dates exist. But what should the secret signal be…? That’s right, Alan Alda. That’s the secret code word. Say “Alan Alda” and the date ends in harmony. It’s perfect, isn’t it?! He’s so comforting, and old, and wryly humorous. I mean, there’s just no way you can think of Alan Alda and get angry. He’s like a glass of warm milk…with a dignified gray head of hair and round creative-guy glasses. Try it out. Seriously. Look into the mirror and say “Alan Alda” as aggressively as you possibly can. What happened? You smiled, didn’t you? You have to smile! You can’t not feel good about the words “Alan Alda.” It’s not possible! 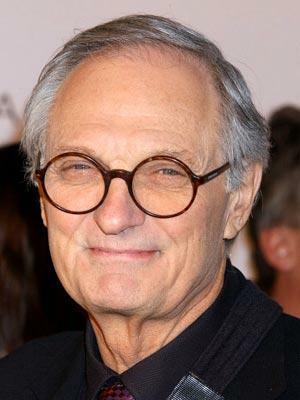 Go to a funeral where everyone’s crying and carrying on and say “Alan Alda.” You know what will happen? Singing. People will be so overcome with joy and relief that they will sing to the heavens. All because of this fantastic little code word that you and I have set up today. It could spread. Soon there will be wars ended by Alan Alda. Waves of pestilence and hunger, stopping dead in their tracks by a simple rerun of MASH. All budget debates will cease and everyone will agree to pay as much in taxes as they possibly can – and really do it. All from Alan Alda. But it starts with you. Spread his gospel. This will only work when everyone knows about it. So go forth on your awkward dates and explain Alan Alda and use him. May you never have to buy another pointless drink or waste a needless hour. Say Alan Alda, and be free!!! I don’t think necessarily being a Republican is date killer. Personally, I am a Republican. I usually save it until the third or fourth date. However, good advice to really ruin a date is ” I love politics, I find them super interesting”. Then further going to describe the newest information regarding the political arena. They will most like fall asleep. Worst case scenario- they pretend to care. Anyway, I would suggest politics in general is a first date killer. It has worked every time- to end relationships and end terrible first dates. I just used the “Republican Card” to kill the potential for a second date. Worked like a charm! I further embellished going to a black-tie affair at $500 a plate to seal the deal. I giggled the whole way through. I wouldn’t date someone who didn’t find politics at least a bit interesting. If you don’t at least know who Hayek or Keynes were, we probably won’t get along. You bring up Thucydides and you can have a kidney. To be fair, I am still single. And a political scientist. Yeah, life’s not great for us. …god, I’m glad I’m not single. How did it go? Hava naguila? i usually play tired or not feeling well. i need to go home i dont feel so good. im very tired also. The best “worst” date I every had was (forgive me) a Craigslist date. We had emailed, talked a bit…but, for some reason, she overlooked the my I stated 5’4″ height and she never mentioned she was 5’9″…So, it was pretty clear from the first few seconds that this was not a going to be the next romance of the century….however, we had a great time just having drinks and taking about dating. I had a bad date last night and as I took the last sip of my drink I said, “Well it was nice meeting you. Good luck with everything.” I think we both knew there was no spark and after the adequate amount of getting to know you drinking time, it was the polite way of ending it. Last night’s date was 1.5 hours. However, I did that after 15 minutes when a date explained he was living with his parents, unemployed, and living not in my neighborhood as required, but in Orange County. Yikes! This is seriously inspired B, I truly hope you have used that one. I’m going to anyway. In fact i think i’m going to take that one on as a conversation starter. Its comedy gold. My tried & true get the hell out of dodge is: start rubbing an eye…blink…”my contacts are totally bothering me, I completely forgot to bring my glasses. I’m really sorry but these bastards are making me feel tired even though I’m not. Would you mind if we called it a night?” Works every time. Just had to use this one on some guy who was not only late but I’m certain was drunk. Weird mannerisms…now that I think about it, he reminded me of Courtney Cox’s ex husband in “Cougar Town”. That’s good. Really good. Would I feel like too much of a jerk using it when I don’t even wear contacts? We’ll see!